Map of Siltreen circa 2E 582. The Siltreen is a region that consists of the eastern portion of Deshaan. Siltreen is the closest to the Padomaic Ocean and is the home of several plantations and other settlements. The Shrine of Saint Veloth is the burial grounds of the prophet, Veloth, who guided the Chimer to Morrowind. Tal'Deic Fortress is a House Redoran stronghold that was once occupied by the Ebonheart Pact. 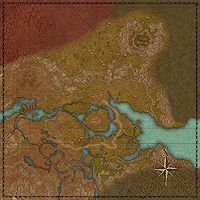 South of Tal'Deic is Darkshade Caverns, one of the most successful kwama mines in Morrowind. Siltreen is bordered by Lagomere to the west. This page was last modified on 19 November 2017, at 17:46.